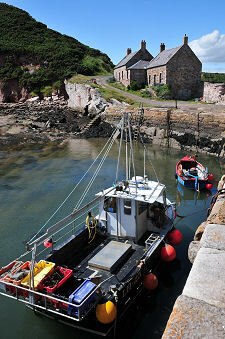 These days Cove Harbour remains in use by a few small fishing vessels that set creels (pots) for crabs and lobsters. All of the buildings associated with the harbour are listed and it is no surprise to find that such a unique spot has been used by more than one film maker looking for somewhere so little-touched by the 20th Century, still less the 21st. The harbour is owned by Cove Harbour Conservation Ltd, who work hard to maintain its wonderfully timeless quality. Those of us who visit this precious and fragile place should take particular care to leave it exactly as we find it, so helping ensure its beauty and tranquility can be enjoyed by future generations. As you leave, remember that its preservation costs money and bear in mind the donation box near the gate at the top of the path. 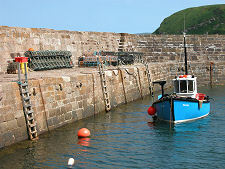 The natural harbour at Cove has been used by local fishermen since the early 1600s, and during the 1700s a number of efforts were made to improve it. These included the digging of the remarkable tunnel through the headland that still provides access to the beach, together with a series of side chambers used to store locally caught fresh fish and a wide range of smuggled goods from the continent. The side chambers continued to be used as changing rooms by hardy bathers until they were sealed up in 1981. Despite this, the walk through to the rock shelter at the far end of the tunnel is an interestingly eerie experience. The harbour you see today was built in 1831. This involved the construction of a breakwater on the eastern side of the bay. 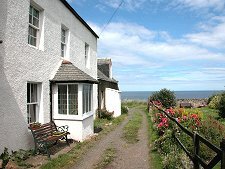 The seaward side of the main harbour wall reveals the extent to which both it and the lower parts of the old cottages on it were sculpted from the natural rock as much as built upon it. This outer side of the harbour wall also gives a strong sense of the forces of the sea against which the harbour provides protection. The lower levels of the rock have been carved into remarkable patterns by the action of the waves, while many of the irregularities provide sanctuary for rockpools when the tide is out. 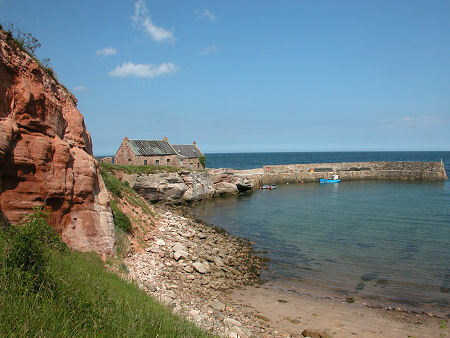 The fishing community that sailed from Cove Harbour in the 1830s supported around 20 families. 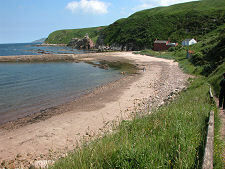 Most of them lived in the planned hamlet of Cove at the head of the track from the harbour. This was first built in 1809 and later expanded to cope with the increased activity that followed the construction of the harbour. Also near the top of the path is an impressive memorial comprising a slab topped off with small figures of women and children. 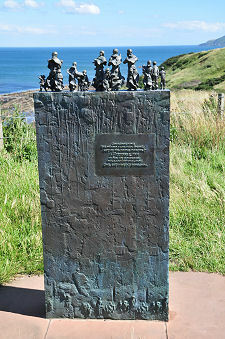 This commemorates the women and children of Cove left widowed and orphaned by the fishing disaster of 14 October 1881, when 189 fishermen from communities along the Berwickshire coast were lost after a sudden storm blew up while the fleet was out at sea. 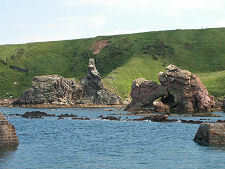 Cove itself lost 11 of the 21 fishermen who worked from the harbour at the time. Despite the disaster, the population of Cove remained fairly steady through the 1800s and there were still 21 families with 50 children living here in 1921. After this the population went into decline. 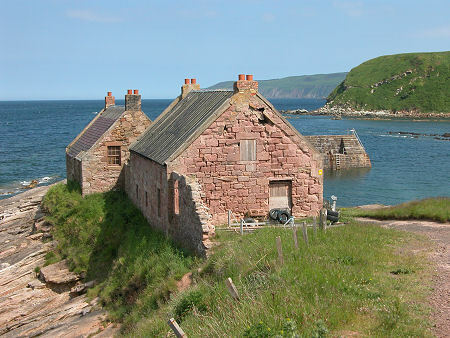 Today the clifftop hamlet is well known to walkers so very nearly at the end of the Southern Upland Way after their long trek from Portpatrick.